Hotels.com Recruits Captain Obvious, but Is One Gag Enough for a Campaign? 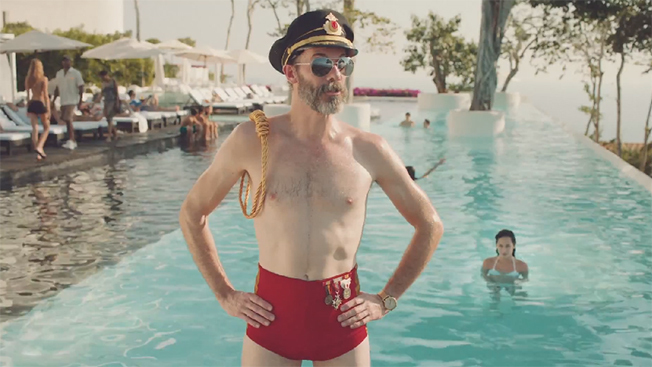 In its first work for Hotels.com since adding the business last October, Crispin Porter + Bogusky goes the self-consciously wacky route by introducing Captain Obvious. As his name suggests, the new spokesman says lots of self-evident stuff to make the point that Hotels.com is the obvious choice for booking rooms. A 60-second spot finds the Captain sauntering through a swanky resort, noting, among other things, that, "'All you can eat' is a hotel policy that allows you to eat all that you can," "the hotel pool is usually filled with water" and "gym is short for gymnasium." Ultimately and inevitably, he notes: "The best dot-com for booking hotels is Hotels.com. It's on the Internet." Skinny, bearded and clad in silly military/bellhop garb (plus the occasional swimsuit hiked up to his navel), Captain Obvious is played by little-known actor Brandon Moynihan, who gives a solid performance. The spot is well shot and directed by Stacy Wall, who lensed this year's Super Bowl ads featuring Tim Tebow for T-Mobile and Ellen DeGeneres for Beats Music. The potential problem is that this is not a one-off commercial, but an entire campaign, complete with print, online and radio. The one-joke approach is deftly handled, but I grew fidgety before the spot finished. And I wasn't phoning room service for more. For me, Captain Obvious is worth a watch once or twice, but—like any ostentatious and irritating hotel guest—risks overstaying his welcome.